Also, keep in mind many of your questions may be answered in the column just to the right, with all the lodging, dining, weather and events links. 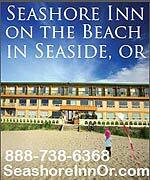 Where can I find lodging on the Oregon coast? Vacation rentals on the Oregon coast? It all depends on where you're heading. You can find Oregon coast lodging listings here, including a format for smartphones. 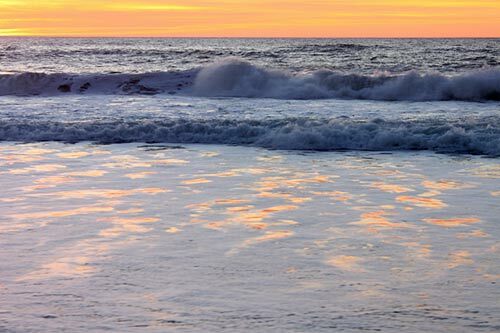 Oregon coast vacation rentals are listed. Links to larger, more detailed listings for each of the areas are found there. There are categories for pet friendly lodgings and oceanfront lodgings as well. Or you can search for what amenities you want here. Where can I find a large, comprehensive list of lodging? The Oregon Coast Lodging Comprensive Guide does just that. Where can find places to to eat on the coast? The Oregon coast restaurant dining guide will help you narrow that down, including some links to the latest restaurant news and reviews. What are the best beaches on the Oregon coast? Now that's a tricky question, and it all depends on what you prefer. Do you like sandy, soft beaches? Ones that go on for miles and miles? Or do you like some rocky spots of interest in between? Do you perhaps prefer purely rocky spots with lots of tide pools and wild wave drama? See the virutal tours at right for further information. Heading north to south, really sandy beaches include Warrenton and Gearhart, most of Seaside, and most of Cannon Beach, the towns of Manzanita, Rockaway Beach, Pacific City, parts of Oceanside, Lincoln City, Gleneden Beach, Waldport, most of Newport, and some areas just north of Yachats. Those with mixed sand and rocky attractions include just south of Cannon Beach, Oceanside, parts of Pacific City, parts of Newport, and the 20-mile stretch between Yachats and Florence. Purely rocky areas include Yachats, Depoe Bay and some spots just north of Manzanita. It's best to follow those links to the virtual tours of each area to get a better overview. Can You Swim on the Oregon Coast? What is there to do? You're kidding, right? The question should be what ISN'T there to do? Beaches and all the obvious means of fun (like walking, sandcastles, kites, wading, etc) abound, and rocky areas provide crazy wave action. But if you love fine dining, attractions for kids, live music, wine tasting and shopping – it's all there. You may find the Atypical Things To Do on the Oregon Coast particularly illuminating, however. Where can I find updated weather? Constantly updated weather forecasts, conditions and alerts are at Oregon Coast Weather. From there, follow links to individual cities for even more information, including tide tables and any weather alerts from National Weather Service. How do I know if there's a traffic problem in the coast range or on Highway 101? Oregon Coast Traffic Conditions has all this up-to-the-minute info and even more. Where can we see whales on the Oregon coast? Probably the best place year-round is the Whale Watch Center in Depoe Bay, as they have people there to help you see them. But they can be spotted from anywhere, though it depends on weather and sea conditions. They are more easily seen from high vantage points. Also, Depoe Bay does tend to have a better vantage point to the year-round whales that tend to linger, and there does seem to be a bit more of them there and just south of Depoe Bay. See the Tips for Spotting Whales and the Oregon Coast Whales page, which features lots of general guides and news about local whales. When can I see whales on the Oregon coast? More tend to be spotted on the great migration months of December into January, and then March through June. More importantly, however, are general conditions. Whales get hidden by large waves and rain with fog, so calm seas are a big plus. State officials say head to a high spot, bring binoculars and plenty of patience. Again, much more is at the Tips for Spotting Whales and the Oregon Coast Whales page. Maps of Oregon Coast? If you're looking for a general map of the area, see Oregon coast map and mileage page. Maps for individual areas – with tons of details about them, including milepost information – are at the virtual tours. For Clatsop County there are the Astoria, Warrenton, Gearhart Virtual Tour, Map; the Seaside Virtual Tour, Map; the Cannon Beach/Arch Cape Virtual Tour, Map. In Tillamook County, it's the Rockaway Beach, Manzanita, Nehalem Bay Virtual Tour Map; the Tillamook Bay virtual tour and map; the Three Capes Virtual Tour and Map for Oceanside, Netarts and Pacific City. 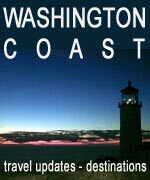 On the central coast and for Lincoln County, there's the Lincoln City and Neskowin Virtual Tour, Map; the Depoe Bay and Gleneden Beach Virtual Tour and Map; the Newport Virtual Tour and Map; the Waldport, Seal Rock Tour and Map; and the Yachats Virtual Tour and Map. Also see the Upper Lane County virtual tour and map for those hidden beaches south of there. What about beach bonfires on the Oregon coast? Camping on beaches of the Oregon coast? What are the rules for dogs? What if I run out of gas? See the Surprising Unknown Rules of the Oregon coast for these answers, including some rules about a few lodgings that aren't always talked about. Where can I find a guide to Oregon coast beaches? Again, your best bets for a serious overview are the virtual tours listed above, which provide you a quick glance what these beaches and towns look like, and then you can click on the individual tour stops to see more. There are literally hundreds of photos between all the tours. Beyond the virtual tours, there are complete guides to some beach areas which list every beach access. See the Seaside Complete Guide, Cannon Beach Complete Guide, Lincoln City Complete Guide and the Waldport, Seal Rock Complete Guide. What is Sea Foam on the Coast? The short answer is a form of phytoplankton, more or less.And no, it's not pollution. It's a good thing. More at Oregon Coast Science Experts: What is Sea Foam? What are these Creatures I Found on Oregon Coast? See the Oregon coast science section to answer questions about creatures found on beaches. Where Can i Find a List of Attractions on the Oregon coast? Oregon Coast Attractions, Spas lists the manmade attractions and the natural attractions. When is the Next Glass Float Ball Drop in Lincoln City? 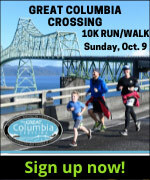 When can you see them around Cannon Beach, Seaside and Warrenton? What are the dangers? How tall is Haystack Rock? What is its geologic origin?